Angel Witch are a British heavy metal band which formed in London, England in 1977 as part of the new wave of British heavy metal movement. Despite critical acclaim in the music press, their only UK chart action consisted of a single week at No. 75 (the lowest position in the charts) in 1980.Angel Witch is the first album by British heavy metal band Angel Witch. The album was released in 1980 through Bronze Records, and since then re-released in four editions over the years. The cover features a painting formerly attributed to John Martin titled The Fallen Angels Entering Pandemonium.The song "Angel Witch" was featured in the 2009 video game, Brütal Legend. 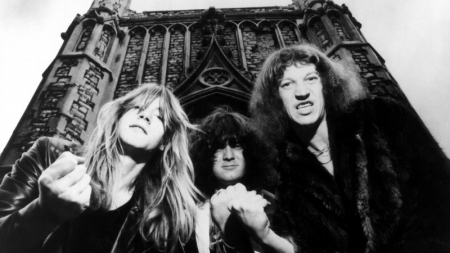 The album made Angel Witch one of the key bands in the new wave of British heavy metal movement.